At 20 Justin Flitter founded one of New Zealand’s first Business Incubators on the top floor of the Wellington Railway Station. At 37 he founded NewZealand.ai focused on helping Kiwi businesses understand Artificial Intelligence. The journey between those points is filled with many fails, a few wins and learning about the power of communities. 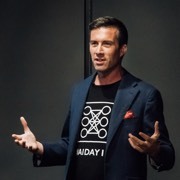 Justin Flitter will share his story, discuss whether machines can be creative, and give you a few predictions for the future.